Not sure if you saw my post yesterday or not, but it was Ozzy and Brandi’s Birthday postin’. Seein’ as to how it was a special day, we were a wantin’ some homemade dog treats awfully bad! I told ya I was gonna get em to help me work on my Lady! She’s a softy when it comes to them pups! Well, we wrangled her into it! She made us this Oatmeal, Peanut Butter and Banana Dog Treats recipe. It’s one of our favorites WOOF!!! I’m gonna let my Lady tell y’all how to make em so your humans can make ya some! 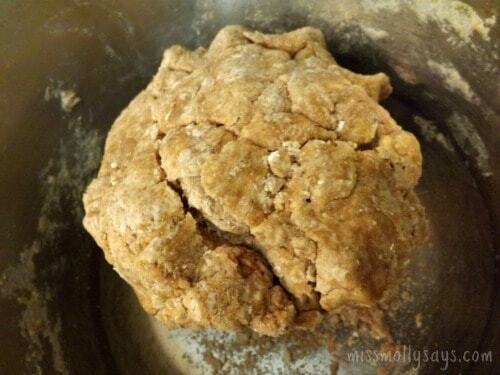 Here’s my Lady’s Oatmeal, Peanut Butter and Banana Dog Treats Recipe! Combine all ingredients in your mixing bowl. The order doesn’t really matter. 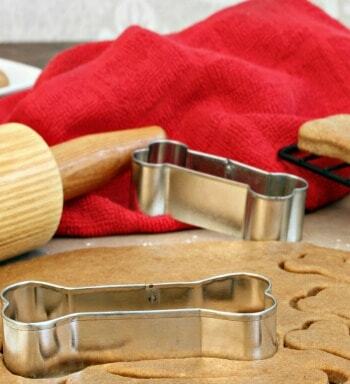 Use some adorable doggie cookie cutters to cut them. This recipe will make a few dozen cookies. All ingredients are safe for human consumption. Because of the egg, I would not recommend feeding this dough to your pup while it’s raw. Like this recipe? 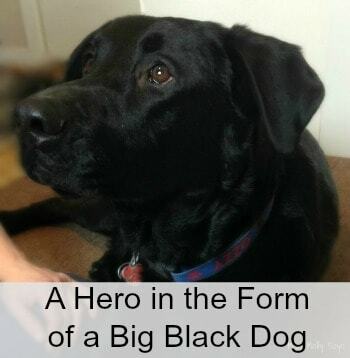 Don’t forget to check out my other homemade dog treat recipes, and pin this one to Pinterest! All ingredients are safe for human consumption. Because of the egg, I would not recommend feeding this dough to your pup while it's raw. How do you store these? What is their shelf life? Great recipe! I’ve never had to store for very long 🙂 They will last a few days in a canister on the counter or you can refrigerate. Because of the egg, I wouldn’t store for very long periods though. I double the recipe. After they have been baked and cooled completely, I divide them up into baggies and freeze them. This way they do not go moldy. I have been making these for 4 months now and my dog loves them. Awsome my dog loves these but do u think I could do this without the egg? Eggs are really good for dogs as long as they’re cooked. You can sub egg with more mashed banana. But i dont know/count the nutrient value…. eggs are good. Recipe that does not have any flour, wheat, white or any other. Ideas? You can always substitute it with coconut flour! I always do that! There is a dog treat recipe with just oatmeal, peanut butter and banana. You need 1 1/2 cup Oatmeal, 1 Banana, and 1/2 cup peanut butter. Cook at 350 for 15 minutes. Is that just oats or so you need to make oatmeal? We’re going to have to make some of these for Sparkie. I’m sure he would love them, especially since he thinks he need a treat all of the time. I made these twice. The first time they were a big hit. The second time they turned moldy in less than 10 days. I didn’t see the comment about refrigeration or only keeping a few days on the counter. I gave them as a gift in a glass jar. Next time I will try refrigerating. I am so excited to make these later today. I used your treats on my website, and I didn’t say thatI created these cookies you can check for yourself. And I had the best idea that after I made them like melt some peanut butter, and once the cookies are done, and cooled down, and the peanut butter is all melted I would drizzle the peanut butter on top. Extra yummy for the dogs. Lol. I have to try that. 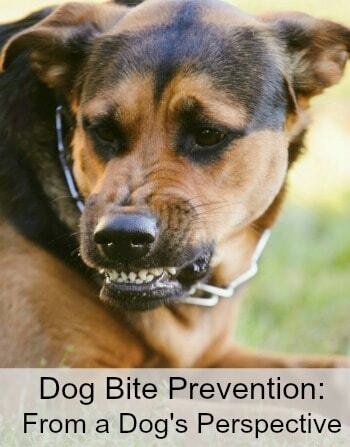 This is a great recipe and safe for dogs. Thanks for sharing. My son and daughter in law recently rescued a dog and I am going to surprise them by bringing these treats for her. I do not have a bone mold but I will do the best I can to shape them like a bone. The dog won’t care what the shape is. Use any cookie cutter you want. i made these and my doggies loved them. Oh! I am so making these for some special pups that I give Xmas gifts too! Love this!! Thanks for the recipe! I’ve never tried it that way, but it’s worth a try. If you do, let us know how it goes. It would still be very healthy for them! If you have rolled oats for the recipe anyway, you can use some of the oats and blend them to a powder making oat flour. I had to do that for one of my pup recipes and it worked beautifully! It works fine with white flour ? I am going to try making these with rice,coconut or almond flour and substitute pumpkin for the eggs. My own pups & my pet clients will like these I am sure! The ingredients doesnt list flour but the instructions say add more flour? Can you freeze these? Or think it will not defrost correctl, like mush. To be honest, I have never tried freezing. I have 7 large dogs here, so they make pretty quick work of them 🙂 If you do give it a try, please let me know how they turn out. 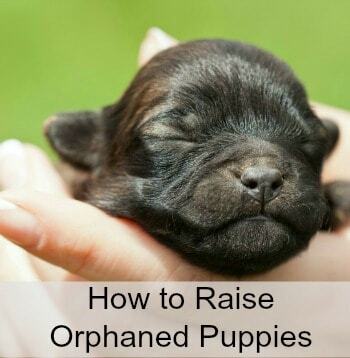 I am assuming that the pups probably wouldn’t mind though. Wonderful! If you do need to store them for a bit, put them in the fridge! And, my beloved Siberian/German Shepherd that passed away a couple of years ago was named Sadie! I’ll try these this weekend. I make Peanut Butter-Pumpkin biscuits for my furbabies, also Carrot-Peanut Butter muffins, and chicken jerky. I always store my dog treats in the freezer because no preservatives are used. They thaw on the counter within a few minutes. I bet my dogs would love these. They absolutely adore anything with peanut butter. I can’t wait to try making them! Ive made two batches of these so far for different groups of dogs in my family and they all love them. I don’t make them as thick though. I also cook them longer as they like crunchier treats, these however brown extremely quick I’ve noticed (in comparison to pb/pumpkin and my PB treats I make). I think it might be the natural sugar in the banana. Just wish I could cook them longer to get a crunchier non soft cookie without them becoming so dark brown so quickly. (Less moisture in the treats also make them last longer) any suggestions? Lower temp for longer? Do they harden up quickly after cooling? I just made these and my dog keeps following me around hoping for another. Thanks for the great recipe. This recipe looks amazing. I might make the dough and freeze what I don’t need. Thanks for sharing. I use a pizza cutter to quickly cut the dough into rectangles and squares. Believe me, the dogs don’t mind me skipping the cute factor at all and it’s quicker and easier for the cook. Hey! Just want to mention if you have a small breed, it would be smart to avoid the chunky peanut butter and peanut chunks could lead to a GI obstruction which would require surgery. My Jack loves these! The only cookie cutter I had was hearts. So cute! These are wonderful. I have been making them for several months and keep them in a freezer bag and take out only enough for a couple days. My dog loves them and so would I if they had salt! I call them Elvis Cookies! I shared this with my cousin and her fur babies loved the treats. She says thanks! I am new to making doggie treats, is regular white flour permissable in this recipe? I think my grand puppies would love this. Anxious to try this recipe, thank you for sharing. The recipe is great but is better gluten free. I feed my small dogs raw homemade dog food and treats that are gluten free. Which is perfect since I eat gluten free. A word of advice I didn’t know about gluten free flour is they need to be weighed by a kitchen scale. Once you find the equivalent gluten free flour ounces to normal flour it’s all easy and usually perfect ? from there. I make all of my favorite old recipes gluten free now. We’re going to try this recipe this weekend! Would this recipe work just as well if I make drop cookies from the dough instead of rolling it out and using a cookie cutter? I’d lower the temperature on the oven so they can cook longer too since they will be thicker. My daughter is doing an Economics project for her 3rd grade class and wanted to do dog treats. We’re thinking she can use the whole “time is money” adage to justify the short cut! 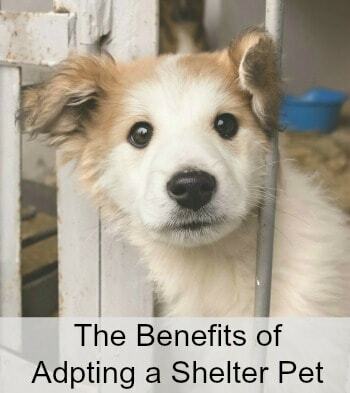 We can’t wait to try them with our dogs too! Can I use white flour? Could I make these treats with all purpose flour? Can I substitute whole wheat flour with Almond flour? Just made these doggie cookies for my granddog Dakota…..they are heart shaped. Question about the oats…Are they quick oats or regular? Thank you! I used quick oats or Quaker Minute Oats. Thank you I just made these for the first time and both of my Boston terrier loved it ! I’m trying these tomorrow for my 3 and my daughters gran-dog a chocolate lab LOKI! I have a Poodle, my daughters Mini Yorkie, and my brothers Jack Russell. Regardless they “ALL” Grans babies!!! We see how it goes. This will be my 3rd homemade treat for them. The other 2 were a success! Any receipts without wheat? I am trying to avoid grains outer than oats for my furry baby! Food allergies…. Just made these for my pup and she loved it. We are grain free with her so I substituted coconut flour instead of wheat flour and almond butter instead of PB. Didn’t have any PB on hand. Will definitely be making more of these. Love the substitutes! I will have to try those also! Thanks for telling me about them! This recipe is great, my 3 yr old poma-chon loves them, its really easy, and I love them too, I just add sugar and voila human version. Thanks for sharing recipe! What a great recipe! I’ve made pumpkin dog treats before and it’ll be fun to have a new recipe! I’m sure my greyhound will love them! I love that they are bone shaped! So cute! Sometimes we have to stop and take time to bake for the dogs as well! Thanks for linking up with Delicious Dishes Recipe Party! Do you have a proven recipe that helps ease skin irritation due to dry, flaking ask n due to seasonal allergies? My furson Ronan has raw skin by the fall. Thank you and happy baking. No necessarily a recipe, but I use coconut oil! I have one – Sallie – that has severe skin allergies. I have had a lot of luck using the coconut oil with her. I give each of my pups a teaspoon on their food nightly to eat. They love it! You can also rub it directly on the itchy spots for relief of the dry skin! We love, love love the coconut oil! I bought organic coconut flour today can’t wait to make these tomorrow! I have to go back to the store as my son ate the bananas I had set aside Lol. We have a Miss Molly, too, and I know she would love for your mom to make these for her. So… I just made these (baking the second batch) and had added only about a heaping 1/2 cup of wheat flour when it seemed a great consistency to start rolling out and cutting. Then I realized as I was cutting out the shapes that I had forgotten the egg! By then it was just too late to add it so I just went ahead and continued to cut them out and bake. So I just wanted to let you and other readers know that the banana and oil in the peanut butter (I used unsalted Trader Joe’s) definitely helped to bind and bake them and they turned out great! I cooked them for 20 minutes at 300 then increased the temp to 350 for about 5 minutes to brown and crisp them. I’m also thinking the lack of egg might also make them last longer. So if any other readers don’t have egg or don’t want to use the egg, they still turned out fantastic and my dog loved them! Awesome! And, thank you for letting us know! I’m sure there are some that might be concerned about the egg and they will possible store longer without it. Thanks again! Are they supposed be hard or soft ? My dog loves bananas and loves peanut butter. He took one sniff of these treats and walked away. Would not even lick them! I guess I have a treat snob, lol. I gave them to a friend and their dog loved them. I actually think it looks good. I made these to see how my fur baby would like them, HE LOVED THEM! He gets so excited when I go to the treat box! I just put a double batch in the oven because we can’t keep them in the house to long before he eats them all! PAWSOME! I am so glad he loved them! Thanks for letting us know! I love how this recipes is made up of all ingredients I have in my house! It’ll make a great holiday gift for all the dogs in the family! I love that these treats contain such great ingredients. Cute cutouts, too! What a great treat for my sister’s dog. She would love to make these because they are so simple. We love when Mom bakes for us. Peanut butter and bananas are both yummy, so this recipe will go in our special cookbook. 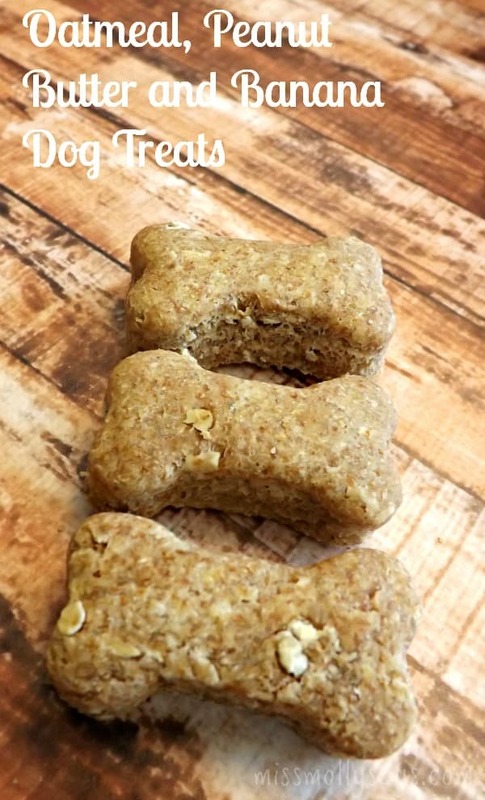 These homemade dog treats look delicious! I would love to make these for my dog. He loves Peanut butter in his treats. 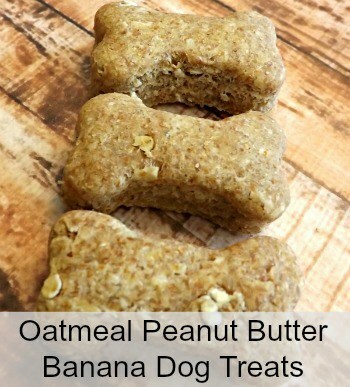 I’m going to try the Oatmeal, Peanut Butter and Banana Dog Treats Recipe. Thanks for sharing! Thank you for sharing this. My dog Cain would go “bananas” for it, pun intended. My dog would love these! I like knowing what is in the treats I give her. Can you freeze these for late Reply? Gotta make these for my fur baby! Thanks! My girl will love these! I make some similar to these but i haven’t tried oats yet. I’m excited to make these for Sky, i love baking for her! Thanks for the new recipe! I want to make this for my dog who loves peanut butter. Thank you, my doggie loves homemade treats!! These look so good. And I do have that one banana left that needs to be used. My pup is going to love these, especially with the peanut butter in them. I’m going to make them this weekend. Thanks for sharing the recipe. 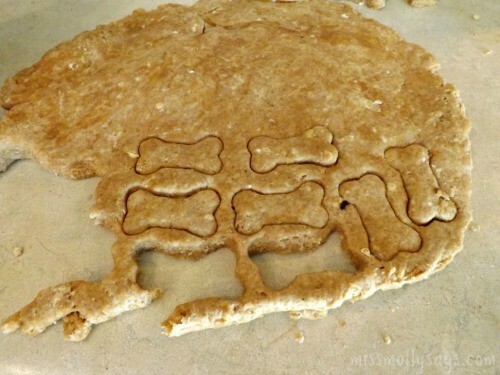 I love making dog cookies … treats, whatever, they love them! What a wonderful and easy to make treat! We are on a tight budget, so making treats at home are a wonderful win/win. Or dogs love the homemade treats more than store-bought. So much healthier too. Can you substitute white flour for the whole wheat? I can’t wait to try this recipe for my Monet….and her cousins Chipper and Tyson. How long will the last and can I freeze them? Wouldn’t putting them in a dehydrator after baking make them last loner? Great recipe! And I think my dog will love it! I am going to try this next and I will let you know how it turned out. When we ran out of our regular dog bones, I decided to get online and see I could find a recipe to try. I was happy to find that I had all the ingredients for this recipe on hand. I just got done making them and all three of our dogs loved them! Thanks for a great recipe! I made these yesterday! I have 3 German Shepherds and one mix. They LOVE them! I made a few batches. So simple to make and after they were done, I bagged them up and put them in the freezer! Impressive looking treats I am sure dogs will enjoy to eat. Are these cookie hard or soft? These definitely look good enough to eat! I made these and my dog loves them. Now that I know they are a success I’m going to make a larger batch and put some in the freezer. My kids thought they looked good too! I love making simple recipes, if they get too complicated I don’t tend to make them again. But I’ll definitely be making these a lot. I know my dog would love these even if they weren’t in dog bone shapes. Seems like a great dog treat! Good idea to freeze these! Made these for my lab-easy to make and she loves them. Second batch I added a touch of organic pure maple syrup. She’s crazy about them! Hi. If I leave the peanut butter out, can I add grated carrots ? Allergic to peanut butter. Thank you. My dog loves anything with peanut butter and bananas just send it over the top! My friend made a batch for me and my six dogs at my house loved them. I think my husband would enjoy these too. bookmarked! !, I like yoir web site!